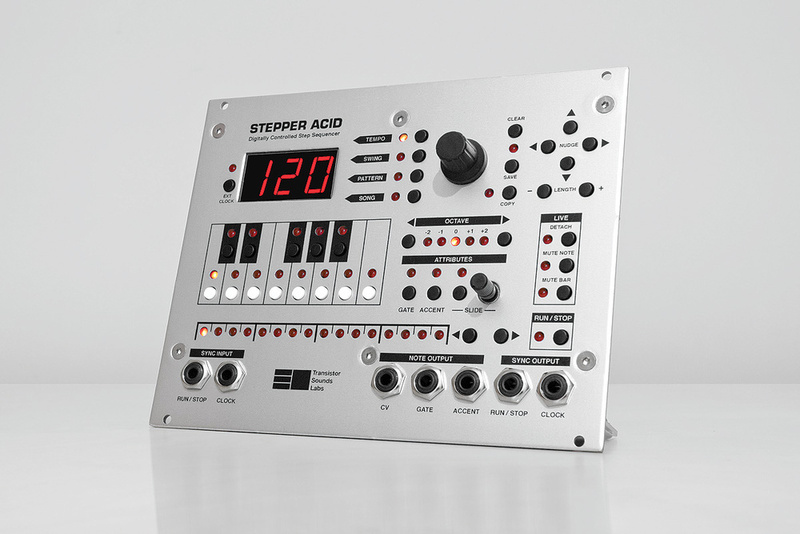 The Stepper Acid is a no-nonsense step sequencer dotted with red LEDs and without a shift key in sight. The developers even made room for a small keyboard to program patterns (acidic or not); all you need to supply is a sound source. Internal storage is provided for 40 patterns, each of between one and 16 steps. To assemble longer structures, the song mode offers a traditional take on stringing together up to 16 patterns. Best of all, you don’t have to stop the music to create and edit patterns or tweak the song. Four buttons to the right of the display perform vital functions such as setting the tempo, the swing amount and choosing pattern or song mode. Having connected the CV, gate and accent outputs to a suitable module, you can play it directly by pressing keys on the mini keyboard. 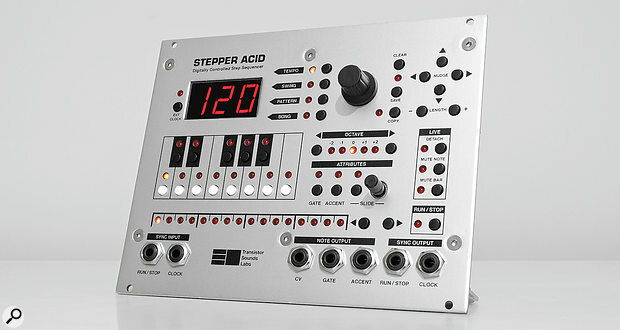 Resisting the obvious TB-303 direction, I initially opted for a Mutable Instruments Elements, connecting the Stepper Acid’s 5V accent output to its Strength input. Patterns are created with the sequencer running or not. Either way, it’s a totally obvious process of adding notes, transposition, slides and accents. Entering notes while stationary is easy enough thanks to those left and right keys for navigation, but it’s even quicker to play them in live. Depending on the tempo, it might take some practice until you’re able to anticipate the right point to hit the buttons but I reckon the occasional late note or misplaced slide adds valuable randomness anyway, perfectly in keeping with the acidic nature. Rather than the fixed slide of many sequencers, a Slide knob is on hand to fine-tune the amount — a knob you can draft in as a cool performance control when required. Once you start tweaking a pattern, the Save LED lights to remind you edits have been made. At any point you can hit the Save button to store where you’re at. Alternatively, you can use the Copy process and store it to a different memory location. Impressively, panel space was allocated for a Clear button too. This either resets the pattern to its last saved state or, if no edits have been made, clears all notes. And for those ‘oops’ moments we all experience from time to time, repeating the action will bring them right back! Nothing beats obvious connectivity and one-button-per-function when it comes to clarity of operation. Naturally, to shorten a pattern you’d reach for the Length + and buttons. Right above them, four Nudge buttons either transpose or move the events to the left or right. Such movement can be crucial for correcting a dodgy start point but it’s fun for generally moving notes around against the beat. Amongst the examples of its live-worthiness, you’ll appreciate the two-stage selection process in which you first scroll through the available patterns before confirming the next to play. The live feature I reached for most often was ‘Detach’ which — to borrow tape terminology for a moment — separates the sequencer’s ‘read head’ from its ‘write head’. In effect, it’s a mechanism for smoothly editing a pattern that isn’t currently playing, ready to activate it later. While detached you can copy and edit patterns or switch into song mode and mess around with the order before returning to let the modified song run. Other live features include toggling the muting of the sequencer output either on the next note or the next bar. Before wrapping up, we should note the external clock and the wide range of resolutions it caters for. These begin at four pulses per quarter note and rise to 96ppqn, taking in all the commonly-seen values between and many not so common. The chosen resolution is especially relevant when you try swing because if you’re using the lowest value, swing is not even possible. Even at the maximum 96ppqn, the swing range is only 0-12 so don’t expect ‘Jungle VIP’ levels of subtlety. Under the covers, the Stepper Acid consists of twin microprocessors, one for the sequencer, the other for the UI. It certainly handles smoothly enough but beyond that, it’s an absolute doddle to use. Other than needing to figure out what swing was all about, I never needed the manual once, which is always a good sign. Finally, while I eventually succumbed and connected an analogue synth to wallow in traditional 303-style patterns, it’s just as much fun driving other modules. If you’re in need of a step sequencer for many styles of uncomplicated, live interaction, check it out.